“Blessed is the man…” is taken only if the feast falls on a Sunday or Monday. because my eyes have seen my Saviour. Whom Moses the lawgiver had foreseen through the cloud on Sinai. He has become a child and submits Himself to the Law. This is He Who spoke through the Law and Whom the prophets foretold. and receive Him with hymns of praise and glory. He is the salvation Simeon has seen. and of Whom the prophets have spoken. without any loss to His divinity. in the Temple according to the Law. O Lord, Who came into the world to save us, glory to You! appears this day as an infant. The Creator of the Law fulfils the Law. and is given over to the Elder. My eyes have seen the mystery hidden from all eternity. It has been revealed in these latter days. and gives glory to the newly chosen Israel. to the wondrous unending life that knows no age. And we pray You to grant great mercy to the world. today submits Himself to the prescriptions of the Law. In His compassion He has become like us for our sakes. is being offered as God to Himself. and granting light to our souls. and Who was prophesied to become incarnate. that uncovers those in darkness. when he received the tablets of the Law on Mount Sinai. He is the Creator of the Law. This is He Whom David announced. He is awesome to all, yet He has great and abundant mercy. into the sanctuary to the holy priest. in the arms of the Elder Simeon. Now I am set free, for I have beheld my Saviour. the One Who fulfils the Law in Himself. and with covered face he rebuked the unbelieving people. and he revealed the Light of the Gentiles, the Cross, and the Resurrection. announcing the Saviour and Deliverer of Israel. Through the Theotokos have mercy on us, O Christ our God. to show the world the Creator and Giver of the Law. for I have seen You, the Saviour of our souls. Who received circumcision and was carried by Simeon. but in very truth has He appeared to the world. Glory to You, O pre-eternal God! is being brought into the Temple by His virgin Mother. He fulfils the promise of His own Law. for my eyes have seen Your salvation, O Lord. Adorn your bridal chamber, O Zion, and welcome Christ the King. on which the King of Glory is seated. bearing in her arms the eternal Son. 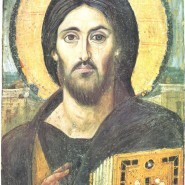 the Master of life and death, and the Saviour of the world. Now You may let Your servant go in peace, O Lord, according to Your word. and from the womb of a Virgin in time. so that he may see the Promised One. and the Saviour of our souls. A light of revelation to the Gentiles, and the glory of Your people, Israel. and is praised with the hymns of the Seraphim. He is the Lawgiver Who fulfils the precepts of the Law. She handed Him over into the arms of the aged priest. and Who brought about the salvation of the world. is now being brought into the holy Temple according to the Law. He is sitting in the arms of an old man as though upon a throne. the Lord and Saviour of all Christian people. Rejoice, full of grace, Virgin Mother of God! * From you there dawned the Sun of Righteousness, Christ our God,* who enlightens those who dwell in darkness. * And you, O righteous Elder, be glad! * You received in your embrace* the Liberator of our souls,** who grants is resurrection. In Tone 1: Let the heavenly hosts marvel at this mystery,* and let those on earth praise in song • as we behold the ineffable condescension of God. * He is now embraced in aged arms,* the One before whom the powers of heaven tremble,* the One who alone loves all. Let the heavenly hosts marvel at this mystery,* and let those on earth praise in song • as we behold the ineffable condescension of God. * He is now embraced in aged arms,* the One before whom the powers of heaven tremble,* the One who alone loves all. 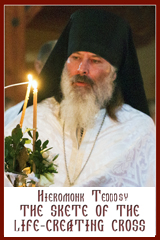 In Tone 1: The One who is with the Father upon the holy throne* has come to earth and has been born of a Virgin. * The One, whose years are incomprehensible, becomes a babe. * Simeon received Him in his arms and cried out, rejoicing:* Now, O merciful Lord, let me depart in peace,* for You have brought joy to Your servant. We extol You,* O Christ the Giver of Life,* and we venerate your most pure Mother,* who according to the Law brought You this day into the Temple of the Lord. verse: The Lord is in His holy temple, the Lord whose throne is in heaven. verse: My heart overflows with noble words. To the King I must speak the song I have made. verse: May this song make your name forever remembered. May the peoples praise you from age to age. verse: Holiness is fitting to Your house, O Lord, until the end of time. In Tone 4: The Ancient of Days becomes a child for my sake. * The most holy God is purified* in order to confirm the reality of the human flesh* which He received from the Virgin. * Simeon, upon beholding this mystery,* acknowledged Him as God revealed in the flesh. * The Elder greeted Him as Life,* and, rejoicing, cried out in his old age:* Let me depart, for I have seen You, the Life of all. May this song make your name forever remembered. May the people praise You from age to age. Through the prayers of the Theotokos,* O merciful Lord,* cleanse me from the multitude of my transgressions. Today the gates of heaven swing open,* for the Word of the Father who has no beginning* has received beginning in time* without any loss to His divinity. * As a child of forty days He is offered by a virgin Mother* in the Temple according to the Law. * The Elder Simeon receives Him in his arms and cries out:* Dismiss me, O Master, for my eyes have seen your salvation;* O Lord, who came into the world to save us, glory to You! Irmos The sun shed its rays upon dry land In the middle of the sea. The water on both sides stood firm as a wall while Israel walked across. They sang this hymn pleasing to God: Let us praise the Lord, for He has been greatly glorified. Refrain: Most Holy Mother of God, save us! O clouds, send down rain; for Christ the Sun, riding upon a swift cloud, is offered by pure hands as an infant into the Temple. Therefore, let us, the faithful, sing out: Let us praise the Lord, for He has been greatly glorified. May the feeble hands of Simeon be strengthened, and his weakened legs be made firm so that he may run quickly to meet Christ. Let us join with the heavenly choirs and sing praise to the Lord, for He has been greatly glorified. Sing out, O heavens, and rejoice, O earth; for Christ the Creator, who existed from all eternity as one of the Trinity, is now offered in the Temple to God the Father as a newborn infant by is virgin Mother. Let us praise the Lord, for He has been greatly glorified. Irmos O Lord, the solid rock of those that place their trust in You, strengthen the Church which You have purchased with your precious blood. The only-begotten of the Father before all ages comes forth from the all-pure Virgin as a firstborn child, and He extends his hands to Adam. God the Word appeared as a child to raise up Adam from his childishness into which he had fallen through deception. Having become an infant without undergoing any change, the Creator has refashioned into his divinity our nature which was taken from the earth and will return to it again. Irmos O Christ, Your virtue has filled the heavens. You were born from an all-pure Mother, the Ark of Your majesty, and You now enter the Temple of your glory as an infant in arms; and the entire universe is filled with Your glory. The Theotokos spoke out: O Simeon, having witnessed mysteries beyond expression, rejoice and take in your arms Christ the Word who has become an infant. This mystery was foretold to you by the Holy Spirit. Now sing out to Him: The entire universe is filled with Your glory. Receive with joy, O Simeon, the infant Christ was is the consolation of Israel and the One for whom you hoped. He is the Maker and Master of the Law who Himself fulfils it. Cry out to Him: The entire universe is filled with Your glory. Simeon marvelled to behold in the flesh, as an infant, the Word who is without beginning, the Source of all creation who is carried by the Virgin as on the throne of the Cherubim. The Elder cried out to Him: The entire universe is filled with Your glory. Irmos In a vision Isaiah saw the Lord seated on a high and lofty throne, surrounded by angels, and he cried out: Woe is me! For I have seen in advance the Incarnate One, the Lord of the light that knows no evening, and the King of peace. When Simeon the Elder beheld the Word carried in the arms of his Mother, he recognized Him as the Glory revealed to the prophet. He cried out: Rejoice, O holy Lady, for you are the throne who carries God, the Lord of the light that knows no evening, and the King of peace. Simeon bent down and reverently touched the footprints of the virgin Mother of God, saying: O pure Lady, I am afraid to hold in my arms the infant God, but you carry Him, the unconsumed Fire, the Lord of the light that knows no evening, and the King of peace. Simeon spoke to the Mother of God, saying: One of the Seraphim purified the lips of Isaiah with a burning ember. You fill me with light as you entrust to me, with your hands as with tongs, the One whom you hold, the Lord of the light that knows no evening, and the King of peace. Irmos When Simeon beheld with his own eyes the salvation which was to come to the people, he cried out to God: O Christ who comes from God, You are truly my God. You are a stumbling stone and an obstacle for the disobedient in Sion, but You are the salvation for the faithful whom you will not let be put to shame. You are truly the image of the Father, begotten before all ages; now in your compassion You have put on the limitations of flesh. Now You may dismiss in peace the servant who worships You as Son of the Most High, and Son of the Virgin, God who has become a child. In Tone 1: By Your birth, You sanctified a virgin womb* and fittingly blessed the hands of Simeon. * You have come also now and saved us, O Christ our God;* give peace to Your community in time of war,* and strengthen its rulers, whom You love,* for You alone,* are the Lover of mankind. Let us run to meet the Theotokos, desiring to behold her Son whom she offered to Simeon. The angelic hosts were filled with awe as they beheld Him from their dwelling place and said: Now we see amazing and extraordinary wonders beyond comprehension and expression. The One who created Adam is carried as babe. The One who cannot be contained is held in the arms of the Elder. The One who is infinite in the bosom of the Father voluntarily takes on flesh in a finite manner, for He alone loves all people. Irmos We praise with fervour the Word of God who sent down dew upon the youths in the furnace as they spoke about heavenly things and who has now taken flesh from the pure Virgin. We sing to Him: Blessed are You, 0 God of our Fathers. Simeon cried out: I leave this earth to declare the good tidings to Adam and Eve dwelling in Hades; and with the prophets he sang joyfully: Blessed are You, O God of our Fathers. God descended into Hades to deliver those imprisoned there; He gives freedom to all the captives and sight to the blind, and He enables the speechless to cry aloud: Blessed are You, O God of our Fathers. Simeon foretold to the Mother of God: A sword shall pierce your heart, O all-pure Virgin, when you see your Son upon the Cross. He is the One to whom we sing out: Blessed are You, O God of our Fathers. Irmos The three youths stood together in the unendurable fire, unharmed by the flame. As defenders of righteousness, they sang a hymn of praise: O all you works of the Lord, bless the Lord and glorify Him above all forever. O Israel as you behold your glory, Emmanuel, the Child of the Virgin, now offered before the Ark of God, dance and sing together: O all you works of the Lord, bless the Lord and glorify Him above forever. Simeon said: Behold the Child who is God; He shall be a sign of contradiction. Let us sing to Him in faith: O all you works of the Lord, bless the Lord and glorify Him above all forever. God the Word, the Source of Life, now becomes a little child; He shall be the downfall of the disobedient and the rising of those who sing to Him in faith: O all you works of the Lord, bless the Lord and glorify Him above all forever. O God-bearing Virgin, hope of Christians, protect and guard and save all those who put their trust in you. Irmos, Tone 3: In the law, the shadow, and the scriptures, we the faithful see a figure: every male child that opens the womb shall be sanctified to God. Therefore do we magnify the first-born Word and Son of the Father who is without beginning, the first-born Child of a Mother who had not known man. O Virgin Mother of God, Hope of Christians, protect, watch, and save those who have placed their hope In you. O Virgin Mother of God, Helper of the world, protect and preserve us from every care and worry. Irmos: We, the faithful, see the figure of Christ in the shadow and the letter of the law which says: Every male who opens the womb shall be called holy to the Lord. Therefore, we extol the firstborn of the Eternal Father and the Virgin Mother. O God-bearing Simeon, come and raise up Christ to whom the Virgin gave birth. Simeon the Elder receives in his arms the Maker of the Law and Master of all. The aged Simeon does not hold Me; but I uphold him, for he entreats Me to let him depart. O mystical Tongs, how do you carry the Coal? How do you nourish Him who gives food to all? Irmos: In ancient times the people offered a pair of doves and two young pigeons. Now the holy Simeon and Anna the prophetess, filled with faith, ministered and glorified the Child of the Virgin, the only-begotten Son of the Father as He was brought into the Temple. O daughter of Phanuel, come and stand with us, giving thanks to Christ our Saviour, the Son of God. The wise Anna, calm in spirit, awesomely speaks out, acknowledging Christ as the Creator of heaven and earth. O Christ, the King of all, grant the faithful victory over their enemies. O pure virgin Mother, the great things done for you are incomprehensible to angels and mortals. Irmos: Simeon cried out: You have granted me the boundless joy of your salvation, O Christ. Now take me, your servant, who is weary of the shadow, and make me a new preacher of the mystery of grace, as I extol You with praise. The pure Dove, the unspotted Lamb, carries the Lamb and Shepherd into the Temple. O Christ, King of all, grant me the gift of tears that I may weep for my soul, lost in evil. Let us devoutly praise the Divinity, the three Persons who shine with a threefold light. O Virgin Mary, enlighten my soul which is grievously darkened by the passions of life. The holy Anna, noble in faith and having the wisdom of years, reverently acknowledged the Master in the Temple; she extolled the Mother of God and praised her before everyone present. the Lover of Mankind now is brought to the Temple. the One who is Lord of life and Master of death. You manifested yourself, O Lord. The Sun of Justice sits upon a light cloud. and showed the beginning of the new grace. Release me from corruption, for I have seen You today. You did not separate yourself from the bosom of the Father. and You were handed over to the arms of Simeon, the servant of God. Now You may dismiss your servant in peace, O Lord, for I have seen You. as You sit upon the throne of the Cherubim. and grant salvation to our souls. The Lord has made known His salvation;* He has revealed His truth before the nations. Troparion, Tone 1: Rejoice, full of grace, Virgin Mother of God! * From you there dawned the Sun of Righteousness, Christ our God,* who enlightens those who dwell in darkness. * And you, O righteous Elder, be glad! * You received in your embrace* the Liberator of our souls,* who grants us resurrection. Kontakion, Tone 1 By Your birth, You sanctified a virgin womb* and fittingly blessed the hands of Simeon. * You have come also now and saved us, O Christ our God;* give peace to Your community in time of war,* and strengthen its rulers, whom You love,* for You alone,* are the Lover of mankind. My soul magnifies the Lord,* and my spirit has rejoiced in God, my Saviour. verse: Because He has regarded the humility of His handmaid; for behold, from henceforth all generations shall call me blessed. verse: Now, O Master, You dismiss Your servant in peace according to Your word. verse: For my eyes have seen Your salvation, a light for revelation to the Gentiles, and for glory to Your people, Israel. And the Irmos, Tone 3 In the law, the shadow, and the scriptures, we the faithful see a figure: every male child that opens the womb shall be sanctified to God. Therefore do we magnify the first-born Word and Son of the Father who is without beginning, the first-born Child of a Mother who had not known man. I will take the chalice of salvation, and I will call upon the name of the Lord. Alleluia (3). Вхідне: Явив Господь спасіння своє, перед народами відкрив правду свою (Пс.97,2). Тропар (глас 1): Радуйся, благодатна Богородице Діво,* бо з тебе засяло Сонце правди – Христос Бог наш,* що просвічує тих, що в темряві. * Веселися і ти. старче праведний,* ти прийняв в обійми визволителя душ наших,* що дарує нам воскресіння. +Слава Отцю, і Сину, і Святому Духові. І нині, і повсякчас, і на віки вічні. Амінь. Кондак (глас 1): Утробу дівичу освятив ти різдвом твоїм* і руки Симеонові благословив ти, як годилось;* ти випередив і нині спас нас, Христе Боже,* але утихомир у брані люд твій* і укріпи народ, що його возлюбив ти,* єдиний Чоловіколюбче. Величає душа моя Господа* і возрадувався дух мій у Бозі, Спасі моїм (Лк 1,46-47). Стих: Бо зглянувся на смирення раби своєї, ось бо віднині ублажать мене всі роди (Лк 1,48). Стих: Нині відпускаєш раба твого, Владико, по глаголу твоєму з миром (Лк 2,29). Стих: Світло на одкровення поганам і славу людей твоїх, Ізраїля (Лк 2,32). Була також і Анна, пророчиця, дочка Фануїла з покоління Асера; вона була вельми похила віком і жила сім років з чоловіком від дівування свого; зоставшися вдовою аж до вісімдесят четвертого року, вона не відходила від храму, служачи (Богові) вночі і вдень постом та молитвою. І надійшла вона тієї самої години й почала прославляти Бога та говорити про нього всім, що чекали визволення Єрусалиму. І як вони виконали все згідно з законом Господнім, повернулися в Галилею, до Назарету, свого міста. Хлоп’я ж; росло й міцніло, сповнюючися мудрістю, і Божа благодать була на ньому. Батьки його ходили щороку в Єрусалим на свято Пасхи. Замість Достойно: Богородице Діво, уповання християн, покрий, захорони і спаси тих, що на тебе уповають. Ірмос (глас 3): В законі тіні і писання образ бачимо, вірні: кожний младенець мужеського полу, що отвирає утробу – святий Богу. Тому первороджене Слово безначального Отця – Сина, що первородиться з матері, яка мужа не знає, – величаємо. Чашу спасіння прийму і ім’я Господнє призову (Пс 115,4). Алилуя (х3).